When you’re swinging a fly for salmon or steelhead using a two-handed rod, controlling the depth and speed of the fly is paramount. That’s why we created the Third Coast Textured Tips. 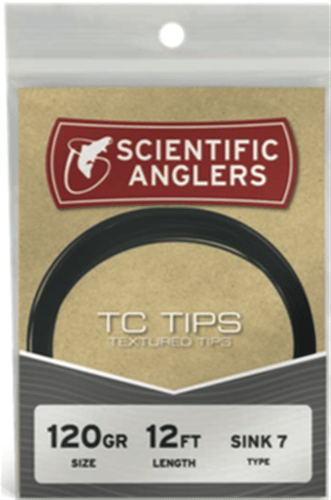 The TC Tip system is a revolutionary approach to Spey tips, as they’re the industry’s first truly tapered, fully textured, double-density sinking tips. Available in a multitude of densities to get the fly just where you need it. I purchased the THIRD COAST TEXTURED SPEY TIPS Complete Kit 10' with SPEY LITE INTEGRATED SKAGIT line and tested this set on a five-day fishing trip. The set is good working! But, unfortunately, there are drawbacks. It concerns the quality of the welded loops on the ends of tips. My S7 tip loop destroyed after a few days of fishing. The same problem, although so far on a smaller scale, is observed at the end of S3/S5 tip, which I also fished, but less than S7. I already wrote to SA about this shortcoming and they promised to correct the defect. But if you if you are still going to purchase these types, I highly recommend that you remake welded loops in the way that you like best. I did this with the Uni Cord 12/0 and LOON UV Knot Sense. It's look not so good as factory welded loops, but, I hope, reliably.